I was talking a few weeks ago about the new trend of TV dramas about the colourful history of TV. There is another one on the horizon, a film about the controversy which greeted the film Life of Brian. Due to be Broadcast in the Autumn on BBC4. The new drama will be written by Tony Roche, whose other credits include In the Loop and The Thick of It. Owen Harris, who has worked on Misfits has signed up to direct. Most people reading this will be too young to remember, but the Church went absolutely ballistic about Life of Brian when it was first released, and the film was completely banned in some areas and whole countries (Ireland and Norway for example). Here is the famous TV debate about the film between Michael Palin, John Cleese, Malcolm Muggeridge and the Bishop of Southwark. Palin kicks their arses. Here (sorry poor Youtube quality - probably filmed off the telly) is the famous Not The Nine O'Clock News parody of that debate. Devout Monty Python fans are complaining that The General Synod's new film 'Life of Christ' is a thinly-disguised attack on 'The Comic Messiah' John Cleese. They even have the same initials - JC! I think this is a very clever sketch and Rowan Atkinson is fantastic. And the rest of this post is about the casting. The links below are to pics of faces. Darren Boyd - John Cleese: Brilliant casting. 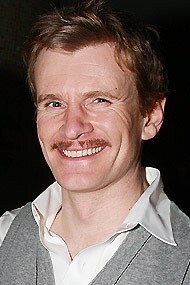 Boyd's a self-deprecating comedy actor, he's immensely tall, and his face quite resembles Cleese, with smallish features and deep-set eyes. Charles Edwards - Michael Palin. I don't really know this guy but he's got the right smile - a lovely smile. Also I think he's a respected theatre actor. Good. 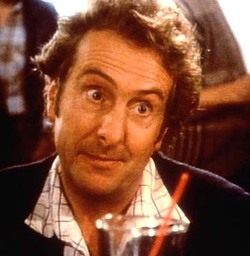 Steve Punt - Eric Idle: OMG Steve Punt is born to play Eric Idle. He's perfect. This is great casting. Rufus Jones - Terry Jones: Don't know him; his face somewhat flatters Terry J. I think Jones is a key role. He directed the film, and he's the most wily of the Pythons in my opinion. I will reserve judgment. Phil Nichol - Terry Gilliam: Canadian stand-up, known to be in-your-face and mischievous. Yes. This could be good. It's good they have a non-actor to play the non-actor. Tom Fisher - Graham Chapman: I don't really know this actor but I think he has a good physical resemblance to Chapman. That's an interesting topic for a drama. Is it slated for BBC4? The original film's terrific, one of my very favourite comedies. Yes. I have amended the post to include that info. Posted hastily forgot to link to the original BBC news story! We watch it every Easter (well, for the last three, a recent tradition). :-D A friend of mine is an Anglican priest and when she was at theological college, they often had showings. I'm not sure if there was any controversy here. All of the Python films were shown widely AFAIK. Good. They were different days, and over here individual town councils would ban it though it had general release. Goodness, yes, I remember all the controversy, including local Christian groups (not mine, which tended to thinking the controversy all rather a hoot and totally overblown) arranging to picket the film (Down with this sort of thing!). I also remember the Not the Nine O'Clock News sketch. I can completely see Steve Punt as Eric Idle. What brilliant casting, all round! I think these TV-about-Tv dramas have been great. Bound to be a Doctor Who one soon enough. I hope it will be about Verity Lambert. Brilliant news, thanks for the heads-up, and the links to the cast - they all look pretty much spot on. Can't wait! I think so - the script is where the genius lies, rather than the cinematography. That's such a wonderful image to start the day with.